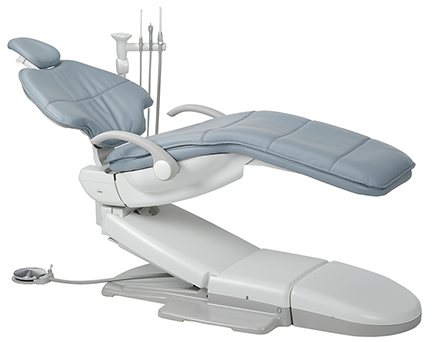 Exceptional patient comfort: Pamper your patients with the A-dec 500 dental chair. Through the science of pressure mapping, the unique cushioning reduces pressure points and provides comfortable support across the patient’s entire body. Motion is also critical to your patient’s comfort. 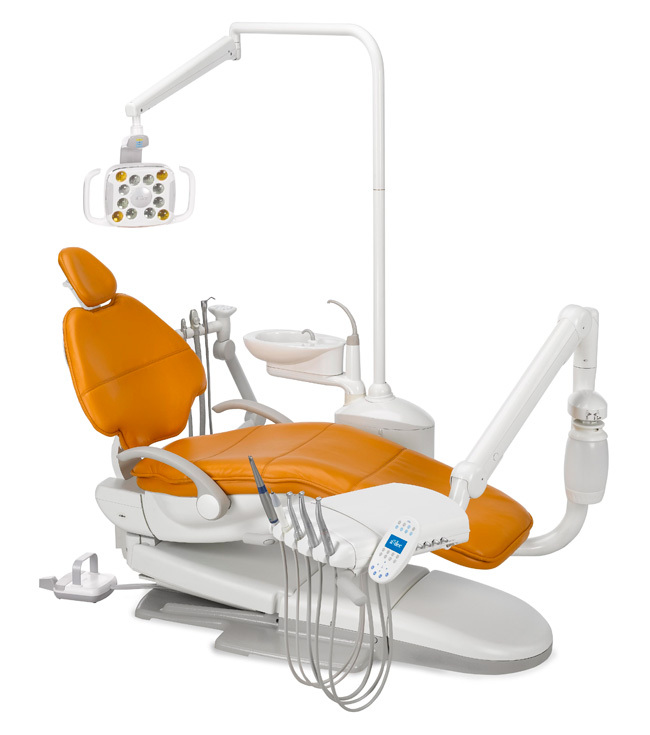 The A-dec 500 dental chair synchronizes the chair movement with the natural motion of the patient. This ‘virtual pivot’ keeps the patient from having to readjust when the chair is lowered or raised. Unsurpassed access: The A-dec 500 dental chair’s ultra-thin backrest and slim-profile headrest provide more leg room under the chair so you can position the patient low enough to gain ergonomic access to the oral cavity. The result? Less strain and fatigue. Ultra-thin backrest that flexes. Enables you to comfortably tuck your knees under the chair, no hard metal back to worry about; cradles the patient in comfort and features upholstery thinner than 25 mm in some areas. Expanded height range. Offers a range from 343 mm to 800 mm so any doctor, regardless of height, can work comfortably. 60° swivel with brake. Allows 30° rotation on each side of center. Innovative 4-position control block design. Results in the industry’s most reliable air-driven component with fewer parts, stronger corrosion-resistant materials, and a unique water flow system that eliminates stagnant water where bacteria can grow. Left/right pivoting chair mount. Provides both left- and right-handed doctors with ergonomic, efficient positioning of the control head. Wet/dry foot control with chip blower/accessory button. Operates handpieces and integrated accessories like your A-dec intraoral camera in conjunction with the A-dec 500 deluxe touchpad. 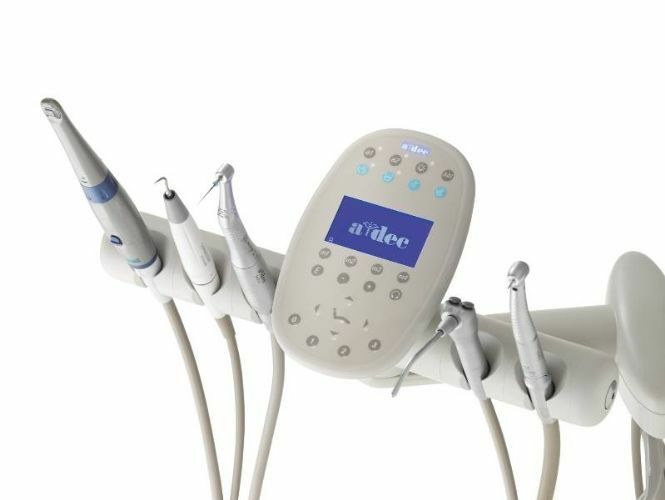 The A-dec 500 is available with the latest LED light. Available as either chair mounted, wall or ceiling mounted. Improved vision: The A-dec LED dental light floods the oral cavity with light. Most dental lights today only provide a light intensity of up to 25,000 lux. The A-dec LED light provides 30,000 lux, the highest level of illumination recommended by dental operatory ergonomic specialists. Accurate tissue analysis: By producing a Color Rendering Index of 90 at 5,000K, A-dec has achieved a new breed of LED that mimics nature. See tissue in pure light for accurate, consistent diagnoses. 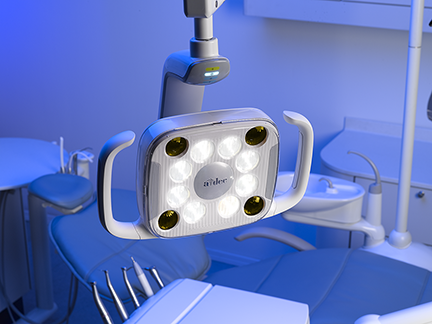 Illumination without curing: The cure-safe mode on the A-dec LED light provides brilliant yellow light at 25,000 lux intensity, enabling the dental team to work effectively without curing photo-initiated resins. Unparalleled ergonomics: Designed for comfort, the A-dec LED light easily glides into the exact position needed for optimal illumination during any procedure. Sustained eye health: A uniform light pattern with feathered edges minimizes shadowing and reduces eye strain and fatigue. Low heat, no noise: Because the A-dec LED light doesn’t emit heat or require a fan for cooling, it’s both comfortable and quiet. Low cost of ownership: The A-dec LED light consumes 80% less power than halogen lights, with a life expectancy of 20 years. The A-dec 500 is available with either halogen or the latest LED light. Both available as either chair mounted, wall or ceiling mounted. The A-dec 500 has a great range of options available, such as built in devices like micromotors, scalers cameras. Click here to see a range of A-dec upholstery colours To discuss the complete range of options and configurations available for this chair please contact us on the details above or email us.